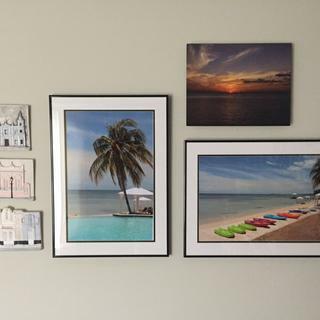 Thanks for sharing this gallery! The matting choices work well with the overall arrangement of the collage and the images all look great together! So happy we could help this wall come together. The frame is nice, don't get me wrong, but a total pain to put together. The instructions were. It great. The second I put the acrylic on my granite it got abrasions. Just wasn't the experience I was looking for. At that price point I want to open a box, pull out my assembled frame and insert the picture. It looks good now that it's done, but I didn't expect it to turn into a DIY kit. Hello Eric. Thank you for your feedback. We apologize that you did not expect to assemble the frame. As a courtesy to our customers, we have a message posted at the check-out on our website that states the 111BLK frame requires assembling. The instructions are included with the frame as well as all the hardware to assemble the frames. Assembling the metal frame is not meant to be difficult and we have instructional videos to provide guidance. We have one collection of Metal frames that does come assembled. That collection is the 'Backloader Collection'. Again, we sincerely apologize for any inconvenience. If you have any further concerns, please let us know. Have a great day! I've purchased these frames before. They're great for simple framing and are very attractive. Easy ordering process, great quality and pricing! This is my only source for frames and supplies. Frame from your company was recommended by graphics specialist making a sign for my husband's classic car for car shows etc. Frame fit perfectly and complemented the sign exactly as hoped. Quick and accurate delivery of custom frame. Framing can be so expensive but these frames were quite reasonable. I've been impressed by picture frames.com not just for the prices but by the packaging, accuracy of sizing etc. Wonderful customer service. Kay was fantastic helping me clear up a mis- cut. Friendly, funny, efficient!! Good frames. Wish they were a little more affordable and shipping times could be faster. Customer service was responsive in replacing one damaged piece. Instructions are absolutely useless, hope you are mechanically inclined! The frame itself was nice, size worked. The acrylic "glass" had a chipped edge from factory cutting, luckily it was just concealed by the frame. Instruction made hardly any sense, but I managed to figure it out only after having looked at a frame I had professionally done. Hello Jim. Thank you for placing your most recent order. We sincerely apologize that the clear acrylic arrived with a chipped edge. We are going to send you a new piece of acrylic free of charge. At your earliest opportunity please email us a photo of the chipped acrylic. The photos will help us improve our quality control. We understand you could have chosen any framing company and we are grateful for your business! Have an awesome weekend! The packaging looked great so perhaps my hopes were too high. We found that the acrylic was cut too short on the long side of both frame sets I ordered. This creates a situation in which the acrylic pops out and will not stay flush with the frame edge. Very disappointed with these frames. Hi Eric. Thank you for your review. We regret to hear that the acrylic arrived this way. This is certainly not the experience we want for you. We are happy to provide you with a replacement piece so that you can frame your piece as desired. Our customer care team is happy to set this up for you. They are available Monday-Friday 8am-7pm eastern time and can be reached at 1-800-332-8884. We appreciate your business and look forward to hearing from you! Can't use it, the size is of. Did send a email about it. Nobody responded. Hello Yolanda. We appreciate your feedback. It appears that the frame was the incorrect size and we sincerely apologize for that. I am grateful that we have had a chance to discuss your issue over the phone and found a resolution. While we aim to respond to your issues in a timely fashion by email, we can always be reached by phone Mon-Fri from 8am-7pm Eastern time. If you are calling outside those hours, we will be more prompt in contacting you by email. Thank you again for taking time to speak with me regarding your order. Your feedback will help us make improvements. I am so bummed I spent $66 on these frames. I really want to return them, but don't want to waste a penny more on sending them back. Do you offer pre-paid return labels? They are much too flimsy and look worse than my poster without a frame. Hello Emily! We regret that the frame does not meet your expectations. These are our most popular narrow poster frames. 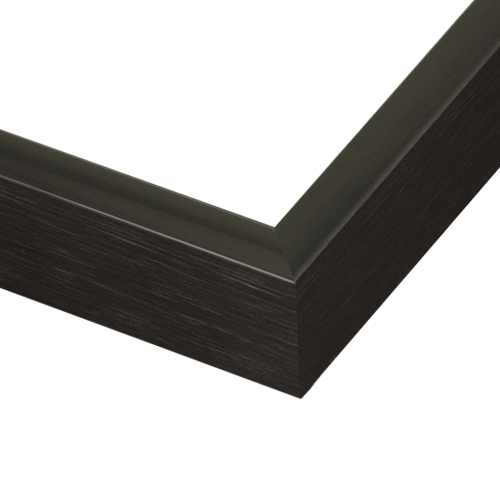 We provide a profile of the frame so that our valuable customers know the frame is 1/4" wide. We are happy to send you a pre-paid return label and give you a refund. Please reach out to us by phone so that we may start the return process. We can be reached at 1-800-332-8884. Thank you for your business! I chose a black frame to bring attention to the seriousness of the safety issue of the picture (buried, no-dig, utility lines) and the shiny finish ,to bring further attention to the subject matter and accentuate its importance. Thank you, for making this type of frame available. looks nice did not want a wide frame. It is the perfect frame for displaying photographs. I needed a frame that would fit prematted art this frame meets my need. Very nice frame for the money. looked like decent quality for the price. Both frames are for student artwork and these frames are a reasonable price, easy to assemble and good quality. I needed a frame that you could chose your own dimensions. simple gallery style. price was right. match other frames I ordered. these are nice looking frames! I have used this particular frame many times in the past. I like the simplicity and good quality. An artist has given me a signed poster he recently designed. I have never framed a poster and this seemed a reasonable choice. I used to purchase this product when framing my pen and ink artwork and it was just right to set the artwork off without calling attention to the frame. Now I'm purchasing it for my photography for the same reason. Simple frame, used before. Sets off sketches well. I like the simple/plain that a black metal frame provides. classic gallery/museum look at a very reasonable price. I've purchased from this company, and used this frame before and it was exactly as depicted. It went together easily and looks great with the matte and artwork. Great buy! Good quality for the money. A basic frame that highlights my photos. Often use this frame. Neat, clean, and allows the work to stand out. Also very good price. The flat profile is elegant and fitting for displays in a gallery. Match other frames I already purchased. how can i order acrylic and backing only? BEST ANSWER: Well, since I have never ordered a frame with acrylic or backing, I would have no idea how to answer this customer's question. I do wonder why this potential customer hasn't thought to give you a call on an actual telephone. I hope PictureFrames doesn't send these queries to me in the future. We recommend calling our friendly framing experts at 1-800-332-8884 and letting them help you place the order over the phone. Does each frame come with just a plexiglass covering or is that cost additional? BEST ANSWER: Hi! Our custom frames do not come with glass. You may add our clear acrylic/plexi and foam backing in section 3 if needed. As always, happy framing! Is this frame "real" shiny or does it have a matte finish? BEST ANSWER: Hello! 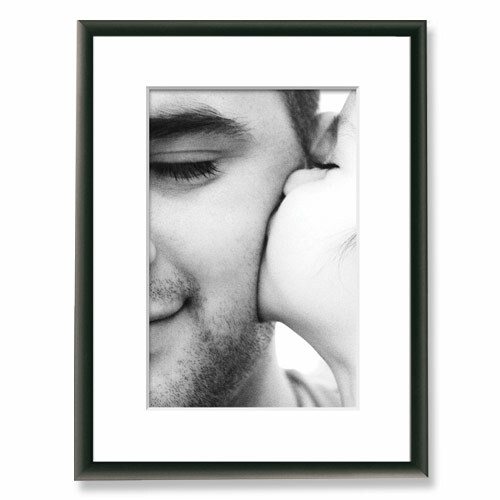 This very popular and economical frame does come in a Mat finish. Please see the frame attached below. Thanks! Can you frame a fabric panel with these? BEST ANSWER: Hello Terry! Yes, indeed. These frames will work with a fabric panel with a depth of 3/8" or less. These frames are fairly shallow. Thank you for your inquiry! If 1 order 10 frames to start, all the same size, do I get an additional discount? BEST ANSWER: We are happy to offer you %15 off this purchase. Please give us a call at 1-800-332-8884 so that we may assist you with placing the order. Also, please sign up for or E-list with send promotional offers directly to your email address. Thanks!